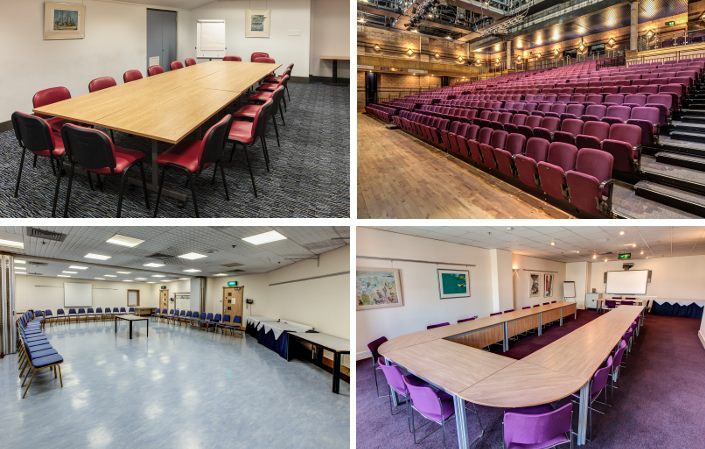 Rothes Halls is one of Fife’s most popular conference and meeting room providers. A purpose-built, multi-function conference centre and performance venue, it’s ideal for trade shows, training events, meetings, conferences, and corporate hospitality. Our spaces are extremely flexible, with 12 meeting rooms, gallery spaces, and two auditoriums that can accommodate capacities from 10 up to 616 seated, or 1,400 standing! Find out more at events@onfife.com. The Studio Theatre is the smaller of our two auditoriums, but is no less flexible, seating up to 200 theatre-style, or 150 banquet-style. It too features state-of-the-art sound, lighting and projection equipment. The Fifespace Gallery is a vibrant, modern space, ideal for a reception or all-standing launch event. We also have a large selection of meeting rooms, seating between six and 30 people boardroom-style, which can be easily adapted to your needs. These rooms are also ideal for workshops and classes, presentations and lectures for up to 120 people. We have a full technical team who will be on hand to help you make sure your event goes without a hitch. A fully licensed catering services is provided in-house and can include speciality teas and coffees, hot filled rolls, sandwiches, light snacks and full meals. For further information, including our highly-competitive venue hire rates, please contact the Rothes Halls Box Office on 01592 612121.